Take a 9 Day South African Adventure with us – Abseil off Cape Town’s Table Mountain, cycle the Cape Peninsula, dive with great white sharks and walk a backpacking trail through the world famous Kruger National Park! This 9 day adventure harnesses a broad mix of adventures ranging from high adrenaline to breath taking, and covers two of South Africa’s most talked about highlights, Cape Town and the Kruger National Park. On arrival at Cape Town International Airport, you will be met and transferred to the Cape Town Hollow Hotel. Here you will spend the next (4) night’s on a bed and breakfast basis. Rest of the day is spent at leisure. Situated overlooking the Dutch East India Company Gardens, the Cape Town Hollow Hotel offers stylish accommodation and spectacular views. The hotel offers an ideal location to some of the city’s best dining experiences, nightlife, cultural and historical buildings. This morning after breakfast, you will be met and transferred to Table Mountain for a morning of abseiling. Please note that the return cable car tickets will need to be purchased separately and is not included in the abseil. After your abseiling experience, you will have the opportunity to spend some time on Table Mountain before making your way down the cable car. From Table Mountain you will enjoy a short tour around Cape Town City. You will be taken past the Castle of Good Hope (the first fort to be built in South Africa) as well as the infamous Green Market Square (the oldest market in South Africa). A drive through the Cape Malay Quarter will create a colourful vision as you see the brightly coloured houses and streets of this historical part of Cape Town. Please note that should you wish to visit any particular places of interest, entrance fees are not included in the City Tour. 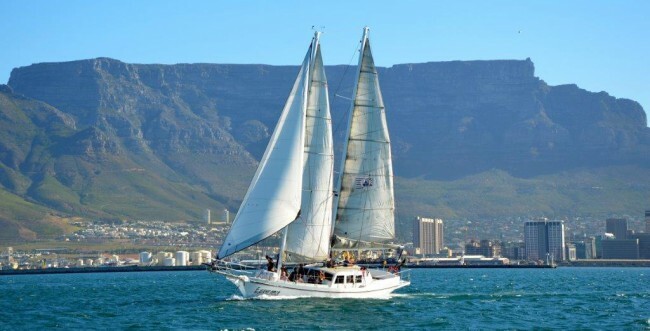 After experiencing the sights and diverse cultures of the Cape Town CBD and surrounds, you will be taken to the V&A Waterfront where you will board a local charter boat and enjoy a relaxing sunset cruise around Table Bay. The sunset cruise is approximately an hour and half to 2 hours and includes 2 glasses of sparkling wine per passenger. After the sunset cruise, you will be transferred back to your hotel. This morning you will be collected from the hotel at approximately 08h30. Today will be spent enjoying the sights and surrounds of the Cape Peninsula by bicycle. The tour starts in Sea Point where you will follow the Atlantic Seaboard through Hout Bay (optional activity not included: Seal island boat ride) and along the scenic Chapman’s Peak to Simons Town. You will enjoy a stop at Boulders Beach where you get to view the African Penguin in their habitat. From Simons Town the tour continues on the Cape Point Nature Reserve. After a stop for a picnic lunch, you will enjoy a short hike to the top lighthouse at Cape Point and on to the Cape of Good Hope. You will return via Scarborough and Kommetjie before being transferred back to your hotel. This morning you will have an early transfer from your hotel to Gansbaai. Here you will enjoy a day of diving with the Great White Sharks. On arrival you will be met by the crew and enjoy a delicious breakfast, while listening to the safety talks. Once you board the boat, you will have the opportunity to go into the cage (wetsuits are provided) and view the sharks in their natural habitat. Snacks and beverages are served on board the boat. On return from the diving experience, you will enjoy some warm soup and bread and get to watch a video of your experience. You will then be transferred back to your hotel in Cape Town. This morning you will be collected from the hotel and transferred to Cape Town International Airport. On arrival you will connect with your flight to Johannesburg. At Johannesburg’s OR Tambo International Airport, you will connect with your flight to Phalaborwa. On arrival at Phalaborwa Airport, you will make your way to the Avis Car Rental desk. Here you will collect your rental vehicle before heading into town. In town you will collect all the necessary supplies required for your 4 night stay in the Kruger National Park. Tonight will be spent at the Mopani Rest Camp on a self-catering basis, and prepare your backpack for the adventure hike that starts tomorrow. This morning you will meet your trail ranger guides who will brief you on the 3 night Lonely Bull Backpacking Trail that you are about to embark on. You will be taken by open vehicle out into the bush where you will be dropped off. After a safety talk you begin your 3 night Kruger Park hiking adventure. Stretching over 3 nights/4 days the trail has no set route and the trail guides decide where to camp. This hiking adventure allows guests to experience the African wilderness by becoming part of the system instead of being a conventional observer. Guests are required to provide their own camping equipment & food for the duration of the trail, and water is sourced by the guides in the bush from rivers, pools and elephant diggings. Vehicles are left at the Mopani Rest Camp in a designated area. The maximum number of participants there can be on a trail is 8, and it conducted by two highly qualified and experienced Rangers. Guests are to bring their own tents as there are no overnight huts along the trails. Every individual is responsible for maintaining a clean environment and responsible for their own set up and cooking. Biodegradable products are requested to be used on the trail. On the day of departure guests will be transferred to the Mopani drop off point by 14h00. You will then drive your rental vehicle to the Phalaborwa Airport for return before boarding your flight to Johannesburg. On arrival at Johannesburg’s OR Tambo International Airport, you will continue as per your own arrangements. ** Day 06 on this itinerary needs to fall on a Wednesday or Sunday, as the Lonely Bull Back Pack Trail is a scheduled departure. ** Please note that a cancellation fee of ZAR 399.00 (including VAT) will be charged in the event that a reservation is not cancelled for a customer who does not arrive. As of 1 August 2016, should a renter fail to cancel their booking prior to the date and time of reservation and fail to pick up their vehicle within 24-hours of that date and time, then a charge for non- cancellation will be applied to the method of payment presented at the time of booking. •	Please note this is a quotation only as no reservations have been made. •	Airfare prices are subject to change without prior notice as well as to fare/class availability. Airfare prices may increase between the time of booking, payment and the ticket being issued. •	African Travel Gateway cannot be held responsible should airlines discontinue flights or change scheduled times resulting in missed connections etc. Should an amendment in a routing or itinerary be necessary, we will re-quote accordingly, subject to availability and rate of exchange. •	To comply with international insurance requirements all airline tickets must clearly show the passenger’s title, full name and surname (as indicated in your passport). Please send me this information as soon as possible. •	Please be sure to carefully check your visa requirements before your intended date of travel, as African Travel Gateway cannot be held responsible should the necessary visa requirements not be met. •	It is strongly recommended that you travel to Africa with at least two blank passport pages per country visited and that your passport is valid for a minimum of 6 months after date of travel. •	Please consult your physician before you travel to Africa for advice on precautions against malaria prior to departure. •	We strongly advises that you take out comprehensive travel insurance covering yourself for personal effects, personal accident, medical and emergency travel expenses, cancellation and curtailment. •	It is now compulsory to bring along your original driver’s license as well as an international drivers permit if your license is not in English. Licence must be valid for a minimum of one year. Avis: Renters and additional driver’s must be in possession of a valid unendorsed driver’s licence of country of residence and an Avis-accepted method of payment. If driver’s licence is non-roman alphabet, an international driver’s licence is required. Please note that Foreigners must also produce a valid passport. Rule of the road - drive on the left hand side. To avoid possible complications when collecting a vehicle we advise foreign travellers to produce a driver’s licence which has been issued in the same country as their passport. •	Please note: Due to the increasing global cost of oil, fuel levies on scheduled and private flights as well as road transfers, may increase at any given moment. Unfortunately this cost will be passed onto you. •	The rates quoted are subject to change without prior warning if there are any increases in bed levies, park fees, fuel, sales tax or VAT, third-party services or any other circumstances beyond our control in the countries featured in this quote.